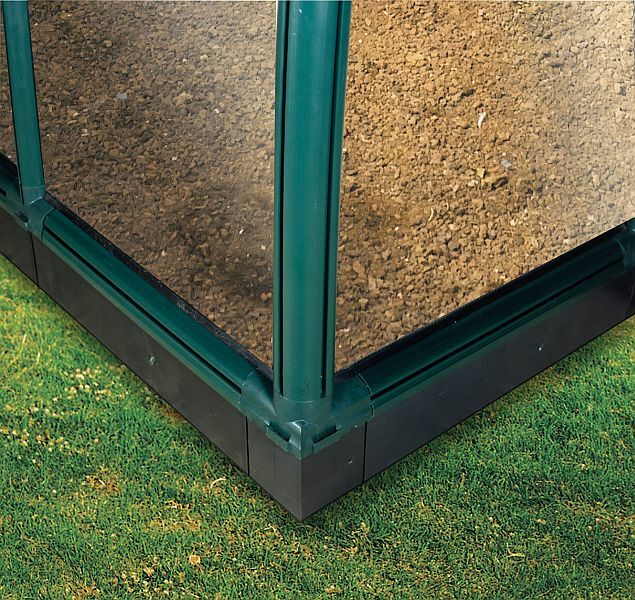 The Rion 40 Series Greenhouse Base Kit is the ideal accessory to bring additional support and help anchor the Rion 40 Series Greenhouseframe to the ground. Rion Base Kits are made of heavy-duty plastic with a honeycomb-like design closed and U-shaped. When filled with dirt, the base will not move, nor will the greenhouse. Areas with high winds may require additional stakes or concrete footers. When ordering the Rion Base for the Rion 40 Series Commercial Greenhouse, please pay special attention to the ordering information below. For the Rion GH44, one (1) Base kit is required. For the Rion GH46, one (1) Base kit is required + one (1) 4 Foot Base extension. For the Rion GH48, one (1) Base kit is required + two (2) 4 Foot Base extensions. For the Rion GH4-10, one (1) Base kit is required + three (3) 4 Foot Base extensions. For the Rion GH4-12, one (1) Base kit is required + four (4) 4 Foot Base extensions. To add onto your existing Rion 40 Series Commercial Greenhouse you will need one (1) Rion Double Extension Kit for each for each additional 4 feet 4 inches of space you require.